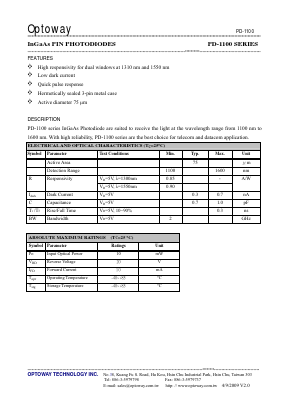 PD-1100 series InGaAs Photodiode are suited to receive the light at the wavelength range from 1100 nm to 1600 nm. With high reliability, PD-1100 series are the best choice for telecom and datacom application. NR7500CP-BC NR7500 Series is an InGaAs PIN photo diode (PIN-PD) coaxial module with optical fiber pigtail. View California Eastern Laboratories.